This sponsored post is brought to you by Madison Reed, the revolutionary new hair color that’s better for your hair. Click here to learn more about Madison Reed. Contains press samples and affiliate links. Madison Reed is a relatively new at home hair coloring subscription service. It’s known as a luxury experience designed by you, for you. Madison Reed has a low chemical profile, gluten free, cruelty free and still able to produce salon quality results in the comfort of your own home. I’ve been coloring my hair at home since I was 13 years old (I’m 31 now), so I can tell you that over the years, I’ve dealt with just about every drugstore brand known to man. Ammonia based dyes smells terrible. I have trouble standing in the same place for 2 minutes when applying an ammonia based dye without fighting the urge to pass out. Peroxide based dyes are not so offensive in smell, but there are times I end up breaking out in a rash. 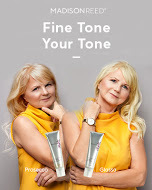 The process of picking a hair color is very simple and you have one of two ways of going about it: You can do a telephone consultation, or you can pick one of the recommended shades based on the choices you picked with the online color advisor: your skin tone, hair type, current hair color and grey coverage. I have warm skin, curly natural hair and a few gray hairs. My current hair color is a color treated light brown that I stumbled upon trying to get the green out of my hair from a mishap over the summer. I knew that I wanted my hair to be fall friendly, like maybe a dark brown with red or auburn tones, so it was a choice between Verona Brown and Sardinia Red. I decided to go with Sardinia Red and completed my order. It took 8 days from the day I completed my Madison Reed order for the color to arrive. It comes packaged in a cute, deep purple shaded box. Gloves, you get two pair and unlike the gloves that are in retail box dyes, they actually fit my chunky hands comfortably. Barrier Cream- smells just like lavender. The barrier cream gave my hair coloring experience a relaxing spa feel. Developer- The developer is a 20 vol which is standard in at home hair colors. A 20 vol is a gentle coloring processor. Cream Color- I have Sardinia Red. The cream is very rich and thick. I know it’s not normal, but please let me gush just a little longer about the gloves. I’m a big girl. I have big hands. The biggest issue I have with box hair color is the gloves. They are normally either spacious but paper thin; or they have the perfect thickness, but they are so tight they bust between my thumb and index finger. So to get a color kit in the mail and the gloves actually fit me? Worth every penny. The coloring process was very simple. Make sure you apply the barrier cream because this dye does stain and the cleansing wipes did not get all the coloring off the first time around. I had to hop in the tub. Madison Reed’s continuous plan, which includes scheduled delivery (every 4-10 weeks, you pick), retails for $24.95. The one time purchase retails for $29.95. You can also order extra hair color if your hair is longer for an additional $10. Shipping is $5. Get 50% off your first order by visiting Madison Reed and using the code BETTERCOLOR at checkout. Find your perfect hair color now! I’ve just started using Madison Reed and I love it! They make it so easy to find the exact right color you want. Love the before & after! I really love the warmth of the new colour. Looks great on you! Great color on you! This sounds amazing and since my DH goes my color for me, he’d be thrilled about the gloves, too. This looks like it worked out really well for you! I love the red color 🙂 I’ve been wanting to try lightening my dark hair a shade or two but I’m too scared to try it at home! I love the color you picked! It sounds like this system is really a step-up from drugstore box color! Such a great colour for you… looks great! It’s nice to hear this doesn’t have the negative effects that the other dyes have, and the colour change is gorgeous. It’s a really nice color, and what a great experience with this box! Your color turned out exactly like the sample photo! Awesome!